Every component in a circuit has a resistance. All tend to obstruct the flow of electricity, although some parts, like a piece of copper wire are very easy for the electricity to flow through. The size of the “obstruction” is called the resistance and it is measured in ohms. The resistance of a lamp might be around 20 ohms, for a piece of copper wire the resistance is likely to be a tiny fraction of an ohm. Resistors are put into a circuit just to obstruct the flow of current, perhaps to control the way the current flows around different branches of a circuit. The conventional international symbol for a resistor is the long rectangle, however the zig zag line is still seen in older texts and publications. 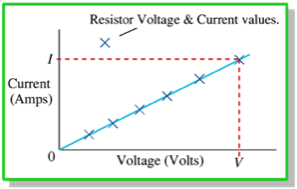 The size of a resistance effects the amount of current flowing through it (since the resistance obstructs the current) and it effects the PD (the voltage) since a larger amount of energy will be required to push the current through a larger resistance. Resistance cannot be measured directly. 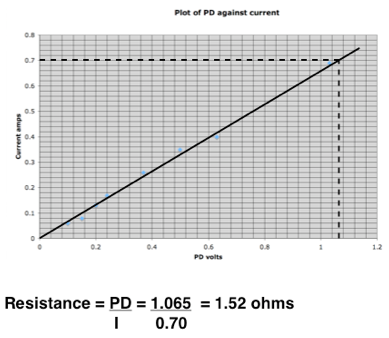 We calculate resistance from the ratio of PD to current. 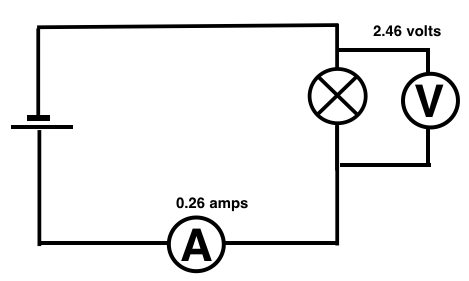 The ammeter has to be placed in series with the resistor so that it measures all the current flowing through it. The voltmeter is placed in parallel (around the resistor) therefore measuring the potential difference (PD) from one end to the other. P.S. A multimeter seems to measure resistance in one go but in fact the calculation shown above is done by the machine. The current through a metallic conductor is directly proportional to the potential difference (i.e. the voltage) between the two ends, providing that the temperature remains constant. Two values taken from the line of best fit is a useful and accurate method of finding an average value of resistance from all of the results. A variable resistor has a long length of resistance material inside it. As the spindle is turned the length of the resistance material is changed which changes the resistance.